Miami Heat small forward LeBron James (6) is fouled by Oklahoma City Thunder small forward Kevin Durant (35) during the first half. MIAMI — And to think the Miami Heat ran out to a 22-4 lead less than six minutes into the game. Kevin Durant put his MVP candidacy on full display and the Western Conference-leading Oklahoma City Thunder routed the Heat 112-95 at AmericanAirlines Arena on Wednesday night for their ninth straight victory. That’s a Thunder team, by the way, still without injured guard Russell Westbrook (knee). Durant had 33 points to extend his string of scoring 30 or more points to 12. He also had seven rebounds and five assists. Durant didn’t score through the game’s first 7 minutes, and his first two baskets were the result of goaltending violations by Chris Bosh and Chris Andersen. He even exited after picking up a second foul with 1:32 left in the first quarter. LeBron James, league MVP in four of the past five years, had 34 points, three rebounds and three assists to lead Miami (32-13). The Heat reserves were outscored 39-21. 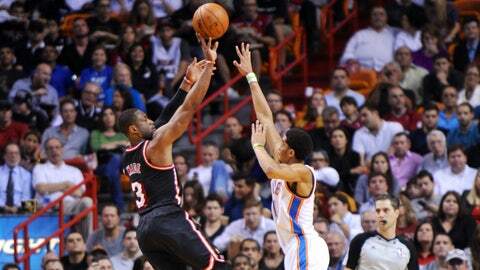 -- Miami's early lead disappears in lopsided loss to the visiting Thunder. After falling behind 22-4 at the start, Oklahoma City reeled off 12 points in a row to get back into it. The Thunder became assertive in the second quarter when they outscored the Heat 11-2 in both second-chance and fastbreak points. The Thunder (37-10) grabbed control with three consecutive 3-pointers — by Reggie Jackson, Thabo Sefolosha and Perry Jones — early in the second half. 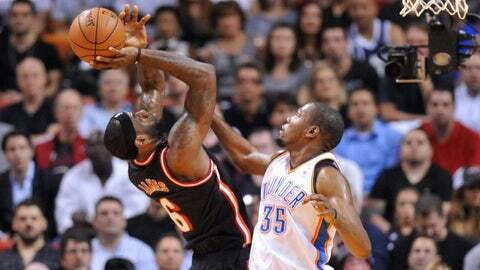 Durant and James each had 12 points in the third quarter, after which Oklahoma City was ahead 91-75. Durant had 16 points and James with 15 at the half with Oklahoma City ahead 55-50. The Heat seemed intent on holding Durant and the Thunder to as few points as possible by running out to 22-4 lead 5 minutes, 40 seconds into the first quarter. Oklahoma City, however, went on a 12-0 run to pull within 22-16 with 2:04 left in the first quarter. The Thunder were outscored 15-2 in center Kendrick Perkins’ 4:36. Jeremy Lamb played the entire second quarter, scoring 13 points on 5-of-7 shooting to help Oklahoma City outscore Miami 34-20 in the second quarter. Durant sat the first 4:04 with two fouls. Oklahoma scored nine straight points — three 3-pointers — to build a 64-52 cushion just 1:38 into the half. Jackson, Sefolosha and Perry Jones hit 3s after two James free throws were the first points of the second half. Um, let’s see … Durant, of course. He hit 12 of 23 shots, including 4 of 9 from 3-point territory. Oklahoma City hit 16 of 27 from beyond the 3-point arc. Miami was 3 of 19. The Heat will play the New York Knicks at Madison Square Garden 8:30 p.m. Saturday.